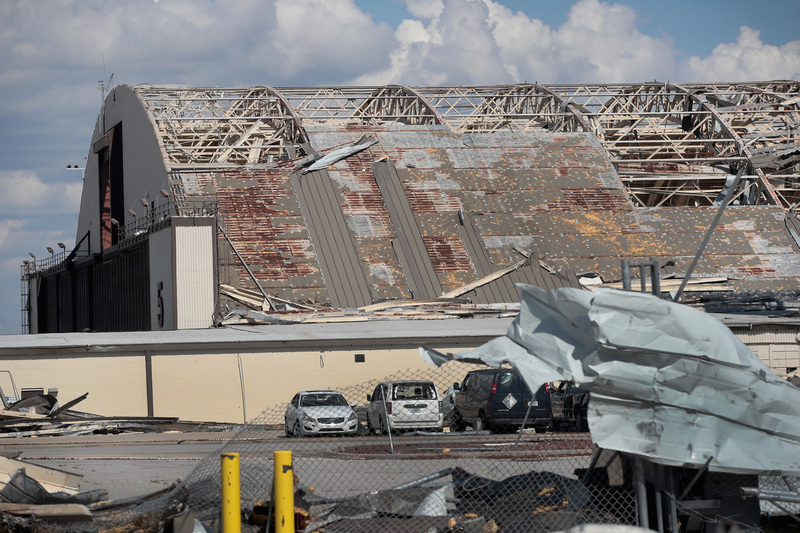 'It Will Be Years' Before Life At Tyndall Air Force Base Returns To Normal Home to 11,000 airmen and their families, the base sustained catastrophic damage when Hurricane Michael came through Florida earlier this month. Residents don't know if they will ever go back. 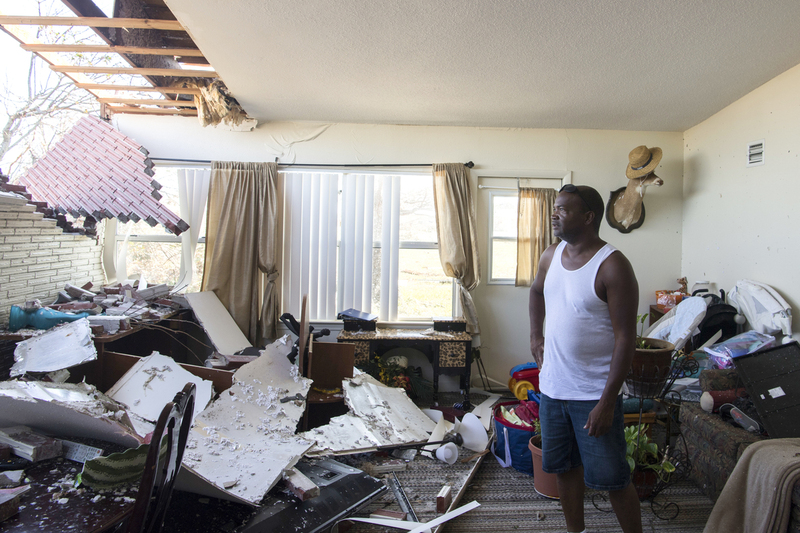 Robert Hill surveys the damage within his living room at Tyndall Air Force Base after Hurricane Michael hit Florida last week. Swimming in St. Andrew Bay was the first thing Jillian Arrowood wanted to do when she moved into her new home on Tyndall Air Force Base in Florida on October 8. She and her two daughters had just joined her husband William, her son and her father-in-law, an Army retiree who had recently had a stroke, in their new home by the water. Her 12-year old daughter didn't have a bathing suit but was so excited that she jumped in the water with her clothes on. It felt like a perfect day: 85 degrees, sunny and slightly breezy. There was no indication of the bad weather that was headed their way. Just as the sun was setting, a nearby airman who had been fishing told them that Tyndall received evacuation orders. Less than six hours after Jillian and her daughters arrived on base, the Arrowood family was packing up to leave, and they haven't been back since. They are one of hundreds of military families that have been displaced from Tyndall Air Force Base as a result of Hurricane Michael. The eye of the Category 4 storm cut straight through the base on October 10, causing catastrophic destruction. The storm reduced houses to splinters, blew off roofs and busted open hangars where top-grade aircraft such as F-22 planes were housed. In total, Brig. Gen. Edward Thomas, the Air Force Director of Public Affairs, estimated that there were more than 860 housing units on the base, and about 11,000 airmen and their families assigned there. Debris litters Tyndall Air Force Base, which was severely damaged after Hurricane Michael. He likened the damage to that seen on Keesler Air Force Base after Hurricane Katrina. He used Keesler as a comparison when estimating how long restorations would take. "I think it would be fair to say it will be years to make Tyndall look like it did before the hurricane hit," he said at a press conference this week. While resumption of training missions could happen in mere months, he said a return to normal living on base does not look likely anytime soon. Those who have been displaced from Tyndall are stuck in limbo, uncertain of what will happen next. For some, the uncertainty lies in whether they will be reassigned and relocated. Reagan Gray's husband, Zack Gray, is crew chief for the F-22, the premiere stealth fighter in the world — each with a roughly $110 million flyaway cost, before any added upgrades and software are added. Tyndall was home to about 55 out of the total 187 F-22s in the U.S. fleet. Some were flown to Wright-Patterson Air Force Base in Ohio, but the Air Force refused to say how many were left behind. Because there are so few F-22s, and so few bases that house them, Gray is now uncertain whether she and her husband will be relocated to another base. She said she knows families who have been ordered to other bases already. For now, Gray has taken refuge with her 2-year-old daughter at her parents' house in Pensacola, Fla., while she waits to see whether her deployed husband will be sent home to help with the transition. Maj. Gen. Andrew Toth, the commander of Air Force's personnel center, said that situations such as these are being handled on a case-by-case basis. They are asking each affected person, "Do you need to come back to Tyndall Air Force Base to take care of your family?" Toth said. Gray said the worst part is not knowing. "It's just all up in the air," she said in a phone conversation. "They aren't really giving anybody any information." Though she hates the uncertainty of waiting for Air Force orders, Gray considers herself among the lucky ones. She was able to assess the damage to her house and gather some belongings when the Air Force opened up Tyndall for the first time this week. She has renter's insurance for her property. She received financial assistance from the Air Force Aid Society through a Stabilizing Assistance Grant. The Aid Society is offering these grants to airmen, whether retired, active duty or in the reserves, to help cover evacuation travel and hotel expenses. The grants are $750 for single airmen, and $1,500 for those with families. The Arrowood family has none of that. They're taking refuge about 1,000 miles away, at their old house in Akron, Ohio. The short time notice given to them about the base temporarily reopening and the cost of the trip prevented them from going back this week. The only knowledge they have of their home comes from aerial photos showing that part of their roof is gone. They have no renter's insurance, since Jillian's husband, father-in-law, and 9-year-old son had just moved into the home in September. They are also currently not able to get assistance from FEMA or the Air Force. "My biggest frustration is that my father-in-law served not once but twice, and he's getting denied the same accommodations that others are getting because he's not Air Force," Jillian said in a phone conversation. "We all serve under the same flag." Her father-in-law, Marvin Arrowood, first served in Vietnam under the draft. Then he re-enlisted to the Army in the 1980s. While the Air Force Aid Society is offering Stabilizing Assistance Grants to airmen, whether retired, active duty or in the reserves, the same aid and benefits are not being given to military retirees in other branches who had been living on Tyndall. Instead, assistance for non-Air Force retirees has been left to the discretion of each military branch. When the Arrowoods contacted the Army for assistance, they were not given aid. "The only options we have are loans," Jillian said. "We can't keep pooling loans." The Arrowoods are also not able to get assistance from FEMA until they make an appointment to look at their home with an inspector. The complication is that they are not able to go to Tyndall this week when it temporarily reopens and don't know when the base will open again. A FEMA spokesman confirmed that claims cannot be processed until an inspector is able to look at the house with someone present. 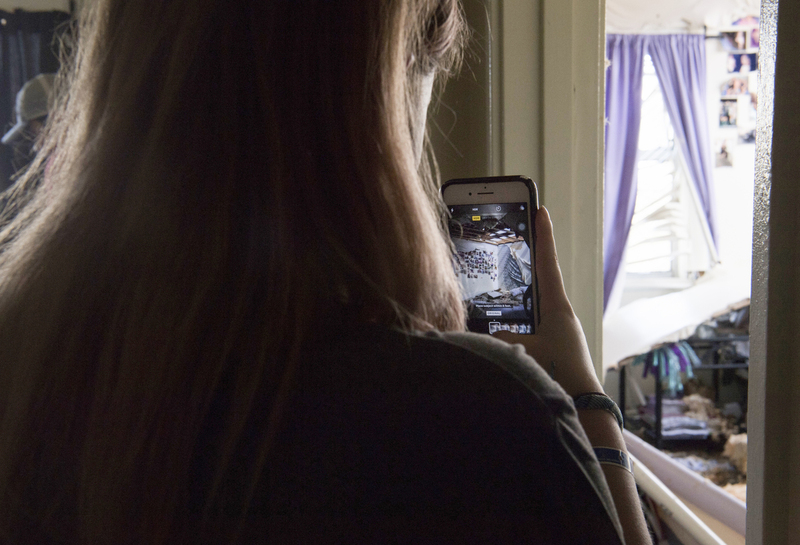 Zoe Reeves photographs the damage done to her bedroom by Hurricane Michael at Tyndall Air Force Base. William Arrowood, Jillian's husband, is now looking for a job in Ohio, and the family is trying to live off of the retirement check that her father-in-law, Marvin Arrowood, gets each month. Jillian has begrudgingly re-enrolled her children into local schools, although she is eager and hopeful she will be able to transfer them back to schools near Tyndall soon. "I want to be able to go back home," she said. "The stuff can be replaced. My biggest fear is not to have the ability to go back on base." Finding Tyndall seemed like a miracle to Jillian — it offered a stable, safe environment for her children; it allowed Marvin to be in a warmer climate as his doctor had suggested, and it allowed him to rejoin the military community and get support. As a former member of the Ohio National Guard, Jillian said that going to Tyndall was an emotional homecoming. She had planned to re-enlist with the Air Force. Though retirees do not make up the main body of residents on Tyndall, Dana Voelker, wife of retired Marine, Randall Voelker, estimates that they are still a sizable portion of the base population. The Air Force has not responded to inquiries on the exact makeup of Tyndall's population. Voelker was full of questions as she spoke on the phone while on the way to retrieve her things from Tyndall this week. "What do retirees do? Where do retirees go?" she asked. "We have nobody." Lacking family to stay with, the Voelkers have been staying in the Holiday Inn Express on Fort Rucker in Alabama, shelling out $80 a night as they wait to see what happens with their home on Tyndall. "The commander is saying the houses are not livable," she said. "What I was hoping is that they would transfer our lease to another military base or relocate us. If they put us out, we are literally homeless." Luckily, the Voelkers' request for assistance from the Army was approved, and they received a $600 grant. They are also able to have their FEMA application processed, since they completed a home inspection with an agent when they returned to base this week. But, they cannot afford to live in limbo much longer. Dana says they are currently living off of retirement and have been racking up costs on their credit card, adding to the debt they had already had before the storm. If unable to return to Tyndall and not given an alternative home, she doesn't know what they will do next. Information is limited as the Air Force begins to do damage assessment and repairs over the coming weeks. The much inquired-about F-22s are currently being evaluated by engineers to see what type of damage they sustained. "Visually all of the aircraft are intact. They generally look to be in good shape," Brig. Gen. Edward Thomas said. "Certainly some damage has been sustained by some of those aircraft. But we expect that they'll all be fixable. They'll all fly again." One military source told NPR, however, that a few F-22s do have significant damage. In terms of what will happen to Tyndall residents, the path forward is more obscure. "We're going to have to make some serious decisions on which families come back to that base or not. There will be families that will be displaced from the base until we make a decision on where they're going," Thomas said. "And then they will have whatever of their household goods picked up from Tyndall that they can and move to another location, but I don't necessarily see a lot of temporary housing." As airmen work to repair the base, it's unclear just how many will be sticking around. "Morale is high, uncertainty is also high," he said.